Optofluidics refers to manipulation of light using fluids, or vice-verse, on the micro to nano meter scale. By taking advantage of the microfluidic manipulation, the optical properties of the fluids can be precisely and flexibly controlled to realize reconfigurable optical components which are otherwise difficult or impossible to implement with solid-state technology. In addition, the unique behavior of fluids on micro/nano scale has given rise to the possibility to manipulate the fluid using light. Due to their unique electronic, magnetic, and optical properties compared with bulk materials, nanomaterials and nanostructures have tremendous potential in many applications. We are devoted to the development of novel nanostructures, which offer interesting photonic properties and could be readily applied to medical diagnostics and therapeutics. These nanostructures will bridge the interface between modern molecular biology and nanotechnology. In the Duke Acoustofluidcis laboratory, we aim to (1) investigate interactions of light and metal at nanoscale to address fundamental issues of nanophotonics, (2) develop cost-effective and high-throughput nanofabrication techniques and nanoengineering methods to produce plasmonic nanostructures for different applications, and (3) design, model and fabricate active plasmonic devices to benefit information technology, and medical diagnosis and therapy. Figure: Schematic of the reconfigurable plasmofluidic lens, wherein a laser-induced surface bubble is used to control the propagation of SPPs at the metal surface. (c–e) Surface bubbles with different diameters (18, 14 and 6 microns, respectively) generated on the gold film. The white dashed circle represents the surface bubble boundary on gold film. Scale bar, 10 microns. Plasmonics provides an unparalleled method for manipulating light beyond the diffraction limit, making it a promising technology for the development of ultra-small, ultra-fast and power-efficient optical devices. To date, the majority of plasmonic devices are in the solid state and have limited tunability or configurability. Moreover, individual solid-state plasmonic devices lack the ability to deliver multiple functionalities. 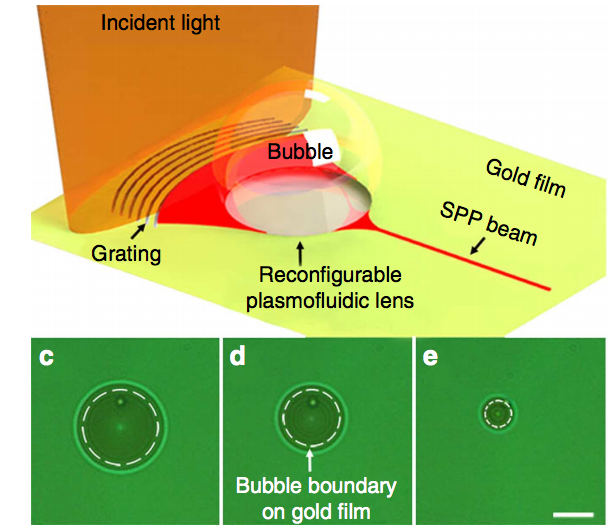 Here we utilize laser-induced surface bubbles on a metal film to demonstrate, for the first time, a plasmonic lens in a microfluidic environment. Our ‘plasmofluidic lens’ is dynamically tunable and reconfigurable. We record divergence, collimation and focusing of surface plasmon polaritons using this device. The plasmofluidic lens requires no sophisticated nanofabrication and utilizes only a single low-cost diode laser. Our results show that the integration of plasmonics and micro- fluidics allows for new opportunities in developing complex plasmonic elements with multiple functionalities, high-sensitivity and high-throughput biomedical detection systems, as well as on-chip, all-optical information processing techniques. 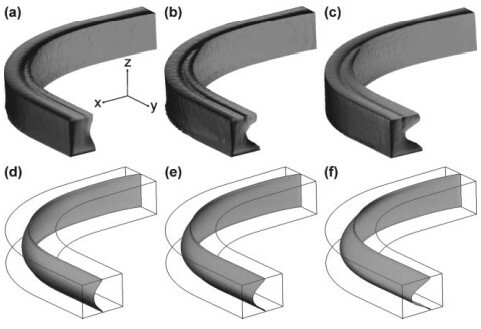 Figure: The 3D architectures of water flow obtained with confocal microscopy at the flow rates of (a) 100 ml min21 , (b) 150 ml min21 , and (c) 250 ml min21 . Images in (d–f) show the corresponding CFDsimulated 3D fluidic interfaces (isosurface of CaCl2 concentration = 2.5 M). We report the design, fabrication, and characterization of a tunable optofluidic microlens that focuses light within a microfluidic device. The microlens is generated by the interface of two co-injected miscible fluids of different refractive indices, a 5 M CaCl2 solution (nD = 1.445) and deionized (DI) water (nD = 1.335). When the liquids flow through a 90-degree curve in a microchannel, a centrifugal effect causes the fluidic interface to be distorted and the CaCl2 solution bows outwards into the DI water portion. The bowed fluidic interface, coupled with the refractive index contrast between the two fluids, yields a reliable cylindrical microlens. The optical characteristics of the microlens are governed by the shape of the fluidic interface, which can be altered by simply changing the flow rate. Higher flow rates generate a microlens with larger curvature and hence shorter focal length. The changing of microlens profile is studied using both computational fluid dynamics (CFD) and confocal microscopy. The focusing effect is experimentally characterized through intensity measurements and image analysis of the focused light beam, and the experimental data are further confirmed by the results from a ray-tracing optical simulation. Our investigation reveals a simple, robust, and effective mechanism for integrating optofluidic tunable microlenses in lab-on-a-chip systems. Figure: Principle and design of the L-GRIN lens. (A) A schematic diagram showing the comparison between the classic refractive lens (A1) and GRIN lens (A2). Change of the refractive index contrast in GRIN lens can result in change of focal distance (A2–A3), and shift of optical axis can result in change of output light direction (A4). (B) Schematic of the L-GRIN lens design (B1), microscopic image of the L-GRIN lens in operation (B2, left), and the expected refractive index distribution at two locations (I and II) inside the lens (B2, right). High optical contrast areas (dark streaks) were observed near the fluidic boundaries (B2, left), suggesting significant variation of refractive index due to the CaCl2 diffusion. (C) Schematic drawing showing two operation modes of the L-GRIN lens: the translation mode with variable focal length including no-focusing (C1), a large focal distance (C2), and a small focal distance (C3); and the swing mode with variable output light direction (C3–C5). We report a tunable optofluidic microlens configuration named the Liquid Gradient Refractive Index (L-GRIN) lens for focusing light within a microfluidic device. The focusing of light was achieved through the gradient refractive index (GRIN) within the liquid medium, rather than via curved refractive lens surfaces. 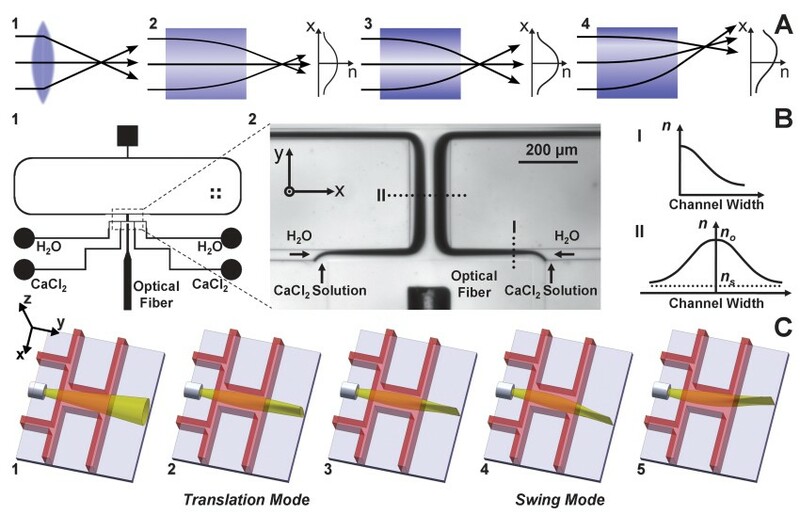 The diffusion of solute (CaCl2) between side-by-side co-injected microfluidic laminar flows was utilized to establish a hyperbolic secant (HS) refractive index profile to focus light. Tailoring the refractive index profile by adjusting the flow conditions enables not only tuning of the focal distance (translation mode), but also shifting of the output light direction (swing mode), a second degree of freedom that to our knowledge has yet to be accomplished for in-plane tunable microlenses. Advantages of the L-GRIN lens also include a low fluid consumption rate, competitive focusing performance, and high compatibility with existing microfluidic devices. This work provides a new strategy for developing integrative tunable microlenses for a variety of lab-on-a-chip applications.